Reverse VIN Lookup is actually the same as VIN lookup of VIN check - a process of checking the car’s history based on its VIN number. The bad news about reverse VIN lookup is that it is not free, the good news is that you can get the car’s history instantly online, without even traveling to your local DMV and suffering all the bureaucratic routine. Reverse VIN history Lookup is a bit more difficult with classic car wit 13-digit VIN numbers. The problem is that major VIN history report providers do Reverse VIN Lookup only for the standard 17-digit VIN numbers which are assigned to cars manufactured after 1981. If you have such a car you’ll probably need to search for classic car VIN lookup. When you do reverse VIN lookup. in is highly recommended to make sure the VIN on the vehicle was not tampered, otherwise you may become a victim to the VIN cloning scam. 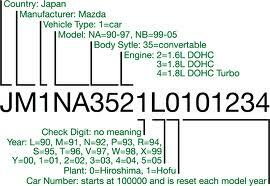 In certain cases, reverse VIN lookup stands for VIN decoding - deciphering the information about the vehicle encoded in the VIN number. Such basic information as make, model, year of production and color can be obtained from VIN history providers for free. As to the rest, you’ll need to do some research. Knowing the VIN is enough not only to learn about the make and model but even very specific characteristics of a model, such as the shape of headlights.The first character is the VIN points to the place where it was built. 2nd and 3rd characters encode the manufacturer. 4 to 8 characters point to brand, engine size and type. 9th character is a check character signifying that the VIN was authorized by the manufacturer. 10th character encodes the model year of the vehicle. 11th points to the plant where the vehicle was built. The last 6 digits are the serial number of the vehicle. Of course, this is the most general information and for any make you’ll need detailed data sheets in order to encode the VIN.